Multi-layer security and end-to-end video encryption protect your video and data from unauthorized access. Have your system up and running in no time with easy-to-follow instructions and the EZVIZ app. Enjoy clear HD 1080p video at night up to 100 feet. 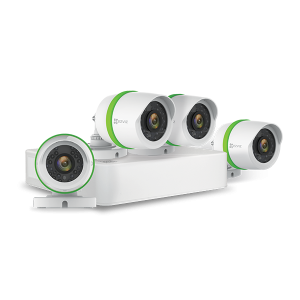 EZVIZ cameras withstand harsh elements such as wind, rain, and snow in tempatures ranging from -40 degree to 140 degree. Record and save all your HD 1080p videos to 1TB hard drive. Everyday 1080p Kits is rated 4.2 out of 5 by 118. Rated 2 out of 5 by JDerek from Great when it works. Terrible when it doesn't. 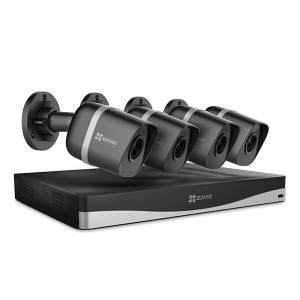 I purchased the 6 camera - 8 channel 1080p system last June. It's mostly worked great. Every once and a while, the cameras take turns acting stupid and jittery. Going in and out. Disconnecting and reconnecting causing me to sometimes get dozens of notifications in a single day. =/ Then in the past week, the DVR itself has gone completely stupid and reboots every 3 minutes or so. I've tried diagnosing and fixing it myself short of actually taking it apart but, nothing. Hopefully someday I can get customer service to respond and get the unit serviced. It's beyond aggravating. We have a "cheap" SD system for 4 years with no issues and this craps out on us after only 6 months. Rated 5 out of 5 by Lizzy1122 from Good cameras Great cameras for the price. can't say to much on the installation because my boyfriend and uncle did it. But just had to crawl in the attic and run wires. Living in Michigan it gets below 20 degrees (or lower) with the wind chill in the winter and in the 100's in the summer. Have not had one problem with them not working with the weather. Great picture. Can see great at night. Took me a while to figure out how to set the sensitivity. Had to figure out what worked best because it was picking up traffic going by. But once figured it out works great. Love that I have the app on my phone and I get notifications sent whenever there's movement. Especially when I'm not home. Rated 5 out of 5 by Big D from Peace of mind We have what was a secluded cabin in the mountains of North Central Arkansas until some unsavory characters moved down the hill from us. As my wife and I do not live in the cabin full time I purchased the cameras from Amazon. As stated in some reviews the instructions were hard to understand. I called the support people at EZVIZ and found them very helpful. They walked me through each step of the setup process. I did have to call the support folks several times and each call met the same great results. The HD quality is better than expected. I love the fact Thai I can check on my cabin while at home in South Louisiana. 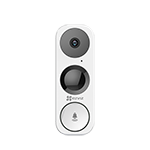 I have recommended the EZVIZ system to family and friends. Rated 4 out of 5 by Boris from Love / Hate Relationship I love this system when it works, which is 99% of time. I do have one camera which has some discolloration which you can see in the pictures below. I have 8 cameras and it is only on one so far on the consistent basis, I don't understand what it can be so I am leaving it as is. All other cameras work fine. App had a problem awhile ago, where I couldn't view my recordings unless I was on a home's WI-FI. But App was probably updated since then and it is working fine now, so the good thing is that system is being imprioved and updated on a regular basis. Compared to ZMODO app that I had and ZMODO system, this is by far the best system. Quality of recordings, notifications, night view are all pluses. So far the only issue I am having is with this one camera... maybe it's a camera, maybe it's a wire, I am still waiting on the EZVIZInsider rep to get back to me. I asked a question, but saw no response. Would I buy the system again? Yes, I would. I recommend this system to everyone. Rated 5 out of 5 by Charlie88 from Unit does what I need very well. I am very pleased with the operation of this Ezviz system. Videos captured are very clear and I like the zoom feature on playback. Running the cabling was fairly easy in my house. I am programming the motion detection now. It is somewhat sensitive and blocking out parts of the screen is taking some time. I wish you could do that remotely but it is what it is. Accessing the system from remote is very easy and works great from anywhere. It has operated flawlessly since I installed it 7 months ago. It is in an area where power fails often. It always comes back up when power is restored. I used a wireless extender for the ethernet connection since it would have been difficult running that cable. It works great on it. 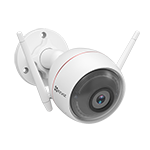 Rated 5 out of 5 by Rocky from AWESOME PRODUCT The clarity and quality of this camera system is amazing! the video capture so much detail , a true full HD 1080. you can see leaves moving on trees 30-50 feet away. at night you can see insects bugs flying around NO PROBLEM catching an intruder (human or animal) and cars that zip by you can check playback and actually zoom in to get more details. No problem with sub zero weather, snow, rain , sleet, and 90+ degree hot sticky weather. with the 4 camera 1 TB i can capture video for entire week on all 4 cams! so impressed i purchased the 6 camera 2TB. 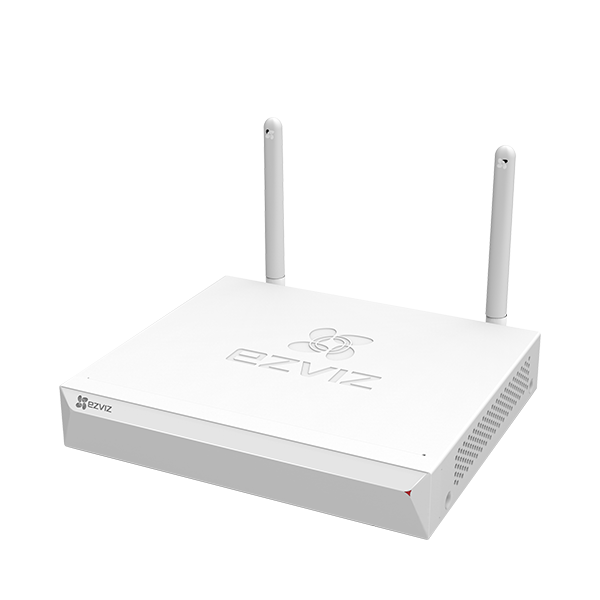 I have EZVIZ FULL HD 1080p Outdoor IP PoE Surveillance System, 4 Weatherproof HD Security Cameras, 8 Channel 2TB NVR I installed the nvr in the bedroom by the router. I would like to see the video on TV in Den. Is there anyway to do this? W/O rewiring? I have a EZVIZ 1080p 4 channel and when the motion capture comes on line my Netflix connection crashes, why is that? Can the cloud function be disabled? How does one disconnect from the cloud function? As your ad indicates, your systems function in -40 temperature, and I am interested in a system that works in -40 weather, I live in northern Canada, so is your statement is true??? how can i adjust the motion sensitivity on my cameras so that each snowflake or bug does not set it off? Where can I get extention cables for the wired cameras? This system has the option to purchase a microphone for recording audio, but does that allow us to use a mobile devise to talk to who ever may be in our house?